‘Sup everyspuddy! How is everyone doing? We’re back at it again with some gouda news! 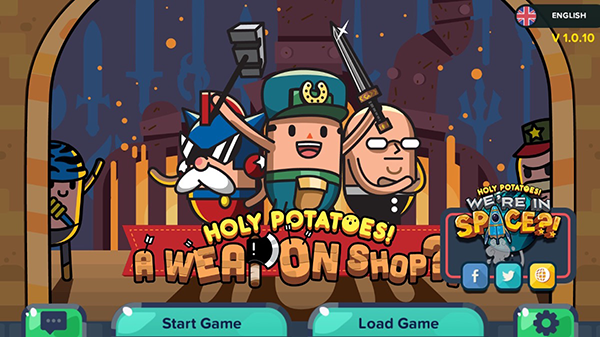 Ever wanted to play Holy Potatoes! A Weapon Shop?! on the go? Well, your dreams are about to come true! 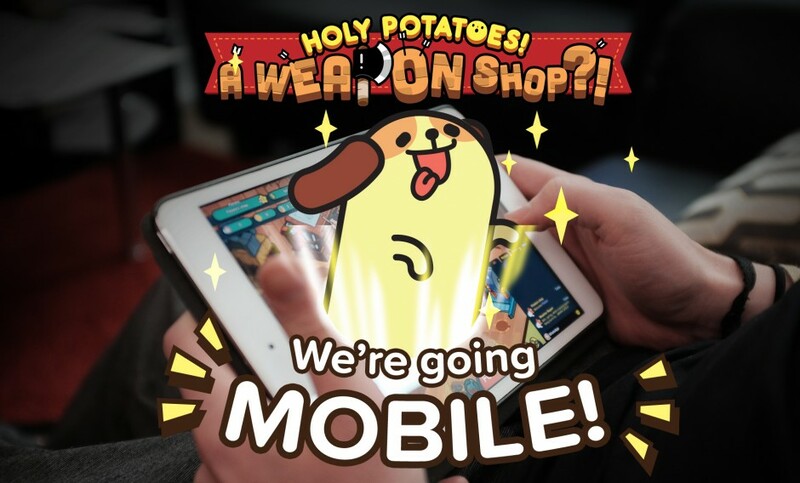 Due to popular demand, HPAWS will be released on mobile and tablets! On top of the development of our third and upcoming game, Holy Potatoes! What the Hell? !, we’ve also been hard at work optimising the app-version of HPAWS! To make the game compatible with smaller devices, we had to change things up a bit. This means everything would have to be bigger, better, and bolder! This makes for major UI changes, so we had to resize dialogue boxes, items, character assets, and even text. As shown from the screenshot above, cutscene dialogues got super-sized! Also, we optimised the cutscenes a little so that you can tap anywhere on the screen to move the text along! 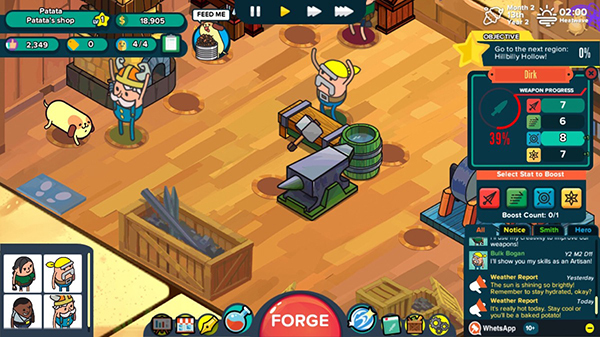 The screenshot of the shop interior shows some of the new and improved UI changes. Firstly, you can see the smith panel on the bottom left has been slightly altered to make it easier for players to tap on the smiths they would like to use! 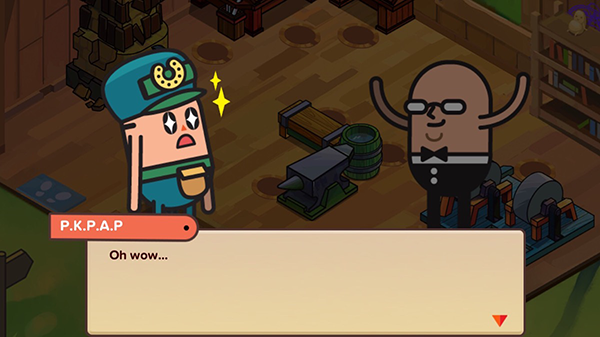 Also, we have added a little scroll bar so that when your shop is fully equipped with the biggest and baddest spud smiths the universe has to offer, you can easily look through them without the sizes of their portraits being compromised. On the right you can see the progress of your craft – in the PC version of HPAWS, there’s a terminate button below the weapon progress circle but for the mobile version we changed it to a little (x) button on the top right instead! Besides the smith panel changes, we increased the Forge panel size to make it easier for players to tap on the actions they would like to perform. Although they are still a bit small on older, smaller phones such as the iPhone 5/5S and the Samsung S2 or S3, the size increase is just enough to enable you to click on the right actions, without mis-tapping on the wrong button. Besides those obvious changes, we have slightly tweaked the WhetsApp, Weapon Progress, Boost, and Objective panels, as well as increasing the size of the game speed buttons up top. 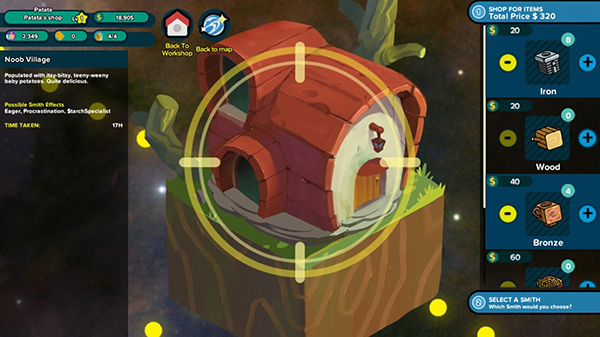 Further UI changes were implemented as shown in the screenshot above, where we increased the size of the item portraits. This makes it so that going out and shopping for all the necessary resources you would need to craft your weapons is a breeze! 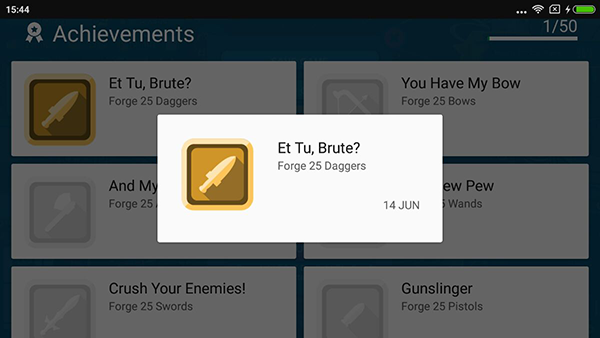 Lastly, we implemented achievements for both Google Play and the Game Center, so all you completionists out there can get your achievement galore fix! In addition, as some of you might have seen or heard, we’re now on Twitch! That’s right spuds, we stream every week on Thursdays from 12PM to 2PM GMT! We’ve done two streams so far – the first one was a self introduction and showcase of the Holy Potatoes! Universe, and our second stream (which happened yesterday) featured HPAWS on mobile and the new HPWTH prototype! Much starchy love to everyone who joined us, it was a blast having you guys and we can’t wait to hang out with you guys next week! If you’ve missed our first two streams, you can catch the VODs here and get involved next Thursday, heheh!